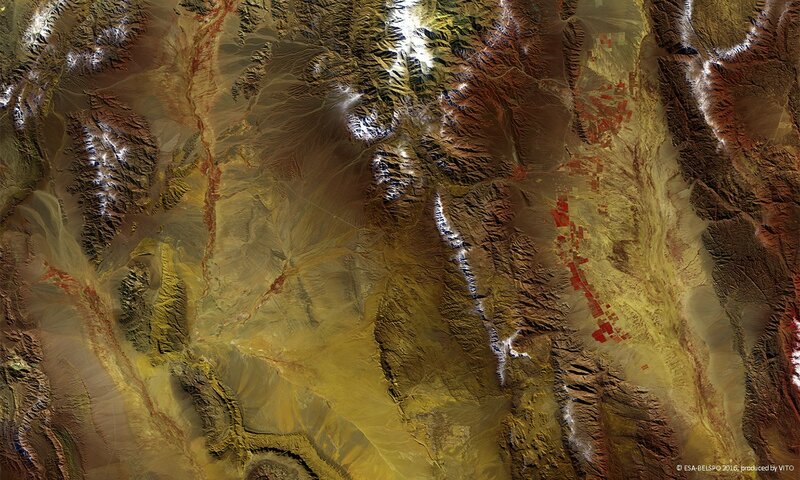 The Talampaya National Park is located between the Andes mountains and the Sierras Pampaneas at a height of about 1,500 m and extents over 2,150 km2. Together with the adjoining Ischigualasto Provincial Park, the area is part of UNESCO’s World Heritage List. Due to its location in the Andes mountains’ rain shadow, the climate is warm and dry, with yearly rainfall amounts below 50 mm and temperatures exceeding 35oC during summer. The Park is known for its coloured canyons that formed due to erosion processes of the Talampaya River and for the paleontological sites containing fossilised animal and plant species that give important insights in the biological evolution of the Triassic Period (about 250 – 200 million years ago). The image of 6 June 2016 shows the Park in the central to lower part, with the Talampaya River running from the upper-left to the central right part. The rectangular red patches in the right part denote the Valle de la Puerta olive and grape area.